D154: DEMO OF EQHSMS DOCUMENT KIT Price 599 USD A complete editable documented Information EQHSMS package System manual Procedures forms process flow chart exhibits plans policies audit checklist Standard Operating procedures aspect impact HIRA etc. Ref ISO 9001-2015 ISO 14001-2015 and ISO 45001-2018 Buy: www.Globalmanagergroup.com For more information about EQHSMS Documentation kit Click Here www.globalmanagergroup.com E mail salesglobalmanagergroup.com Tele: +91-79-2979 5322 Page 3 of 10 Section – 2 4 to 10 Chapter 4 to 10 covers sample policy objectives scope context of organization and macro level quality management system explaining how requirements are implemented by organization in making the system as per the revised standard. Approx 35 pages 4.0 to 10.0 ANX–I List of documented information 1 – 1 ANX–II Glossary of terms 1 – 1 ANX–III Company activity process flow chart 1 – 2 ANX–IV Organization structure 1 – 1 2. Procedures 13 procedures: It covers a sample copy of mandatory procedures as per ISO 9001:2015 ISO 14001:2015 and ISO 45001:2018 covering all the details like purpose scope responsibility how procedure is followed as well as the list of exhibits reference documents and formats. The list of sample procedures provided is as below. List of Procedures 1. Procedure For Identification of Environmental Aspects HSE Hazards and Its Environmental Impacts and Risk Assessment 2. Procedure for identification of compliance obligations 3. Procedure for communication participation and consultation 4. Procedure for operational control 5. Procedure for emergency preparedness response 6. Procedure for monitoring and measurement 7. Procedure for document and data control 8. Procedure for corrective action 9. Procedure for internal audit 10. Procedure for management review 11. Procedure for Risk Management 12. Procedure for Control of Non–Conforming Products 13. Procedure for training 3. Process Flow Chart 11 process templates It covers guideline for processes flow chart and process model useful for process mapping. It covers process flow chart and activities of all the main and critical processes as listed below with input-output matrix for organization. It helps any organization in process mapping as well as preparing process documents for own organization. In Input and output matrix list of documents input and output as well as interlink age of documents with other departments are given. D154: DEMO OF EQHSMS DOCUMENT KIT Price 599 USD A complete editable documented Information EQHSMS package System manual Procedures forms process flow chart exhibits plans policies audit checklist Standard Operating procedures aspect impact HIRA etc. 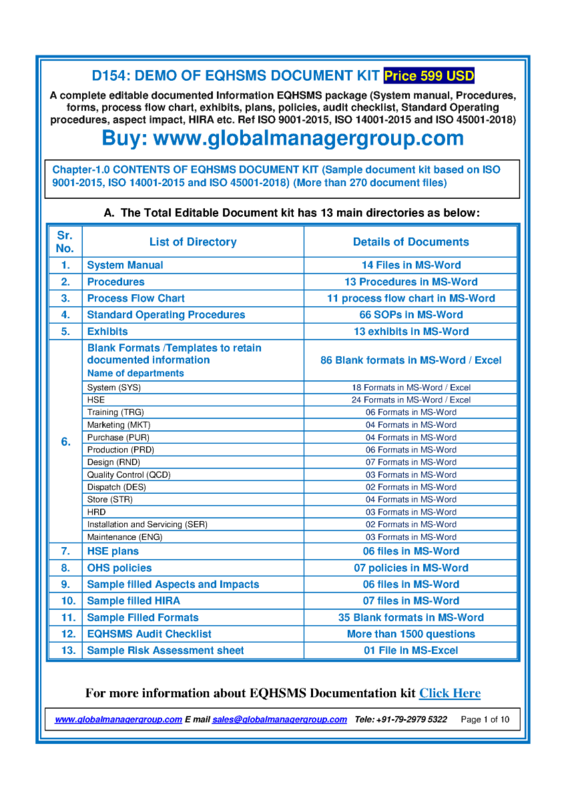 Ref ISO 9001-2015 ISO 14001-2015 and ISO 45001-2018 Buy: www.Globalmanagergroup.com For more information about EQHSMS Documentation kit Click Here www.globalmanagergroup.com E mail salesglobalmanagergroup.com Tele: +91-79-2979 5322 Page 7 of 10 10. Sample filled HIRA- Hazard and Risk sheet The ready to use HIRA in filled form is given to prepare the HIRA document for the organization. List of HIRA 1. Hazard-risk assessment sheet for Electrical area 2. Hazard-risk assessment sheet for Engineering area 3. Hazard-risk assessment sheet for ETP area 4. Hazard-risk assessment sheet for General area 5. Hazard-risk assessment sheet for Production area 6. Hazard-risk assessment sheet for Utility services area 7. Hazard-risk assessment sheet for Waste disposal area 11. Filled formats 35 sample filled formats It covers a sample copy of filled forms required to maintain records as well as establish control and create system in the organization. The samples given are a guide to follow and the organization is free to modify the same to suit their own requirements. It can be used as templates. A total of 35 formats are provided as per the list given below. List of filled formats 1. Master List Distribution List of Documents 2. Change Note 3. Master List of Records 4. Quality and Environmental Objectives Monitoring Sheet 5. Audit Plan / Schedule 6. EMS Internal Audit Non–Conformity Report 7. Communication Report 8. Induction Training Report 9. Job Description Specification 10. Training Report 11. Order Form / Order Confirmation 12. Customer Complaint Report 13. Customer Property Monitoring Register 14. Indent And Incoming Inspection Record 15. Approved external provider list Annual purchase order 16. External Provider Registration Form 17. Disposal of Non–Conforming of Product Service 18. Spray Dryer Log Sheet 19. Reverse Osmosis Log Sheet 20. Process change form 21. Research and Development Plan 22. Design Development Monitoring Register 23. Design Review Report 24. Design Review Minutes of Meeting 25. pH Meter Calibration Report 26. Sample Test Request Slip For In process / Finish product 27. Packing Report / Slip 28. Gate Pass 29. Preservation Assessment Report 30. Performance Appraisal Records– Functional Heads 31. Manpower Requirement form 32. Installation Commissioning Progress Report 33. Service Report 34. Breakdown History Card 35. Preventive Maintenance Check point 12. EQHSMS Audit Questionnaires More than 1500 Questions This covers audit questions based on the ISO 9001:2015 ISO 14001:2015 and ISO 45001:2018 requirements for each department as per the list of departments given below. It will be a very good tool for the auditors to make Audit Questionnaire for auditing. It will bring effectiveness in auditing. A total of more than 1500 Questions are prepared on the basis of ISO 9001:2015 ISO 14001:2015 and ISO 45001:2018. It can be logically used for auditing during internal audit for ISO 9001:2015 ISO 14001:2015 and ISO 45001:2018 to establish proper audit trail 13. Sample risk assessment sheet The ready-to-use risk template in editable form is given to prepare the risk document for the organization. It is given in an excel format and can be used as a template.